Dude Gets A Tim Tebow Tattoo... Seriously (PIC) - Fantasy Football, Fantasy Football Rankings | Mac Bros.
Well, it happened. 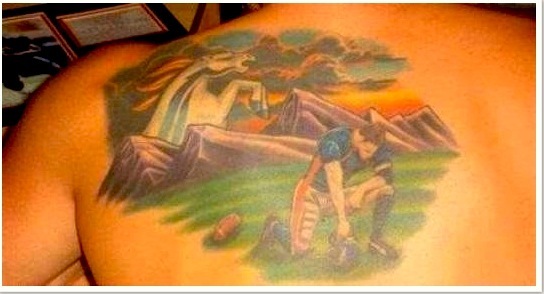 Some guy got a tattoo of Tim Tebow (sort of) Tebowing, along with a bronco and the Rocky Mountains in an airbrush-esqe landscape of orange and blue sky. As big a fan of football as we are, this strikes as an epically bad idea for more reasons that we care to list. Mostly because we're too lazy to list them, and partially because it's pretty obvious.